Sign up for free and just shop with TK Maxx as normal. Cashback is unavailable at TK Maxx. Payout is only available on Avios Points. Avios rates are subject to change both up and down. Recurrences on the amount of purchases that can be made while earning avios points may be limited. 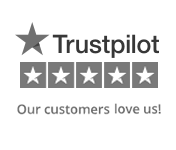 This merchant calculates avios points excluding VAT, delivery and any other charges. TK Maxx avios points are available through TopCashback on genuine, tracked transactions completed immediately and wholly online. TK Maxx avios points can be earned simply by clicking through to the merchant and shopping as normal. Transactions for this merchant should appear as pending within 24 hours. They will remain at this status until the retailer confirms that we're eligible for avios points. Once this happens your purchase will reach the confirmed stage of your account. When the merchant then pays us the avios points we can make this payable in your account. If you love getting your hands on designer gear for less, you will love shopping at TK Maxx online. That is because they offer fashion, homeware and much more from the biggest brands at low prices which are up to 60% less than the Recommended Retail Price (RRP) and at a significant discount compared to those seen in department stores or on the high street. Whether you are looking for men's, women's or kids' clothing, footwear and accessories, home furnishings or gifts, they offer an ever-changing selection of the best labels. Most of the items you will find online are current season styles, while the fact they receive several deliveries a week -- each containing thousands of items -- means you are sure to find new big-brand and designer products every time you visit their website. 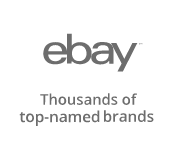 You will not find TK Maxx sale events -- just great prices all of the time -- while you will be able to save even more if you sign up to TopCashback, thanks to our deals and TK Maxx discount codes, if available. If you spend more than £75, you will also benefit from free UK standard delivery. TK Maxx know that everyone has their own individual style, which is why their range of women's fashion is full of one-off and quirky pieces from big brand names, as well as all of those essentials you cannot live without. You can enhance your look or go for a completely new one by shopping for dresses for every occasion, coats, jeans and skirts from leading brands, while you will also find everything from jumpsuits and sweatshirts to lingerie, nightwear and beachwear. When it comes to shoes, you can step out in heels, boots or flats, while you can complete your look with accessories ranging from beauty products, bags and scarves to sunglasses and audio. Take a look at edits such as Cashmere, Partywear and Gold Label if you are looking for something specific, while you can also buy sports accessories and skiwear if you love keeping fit ot hitting the slopes. Check out the women's clearance section, meanwhile, for even bigger savings. 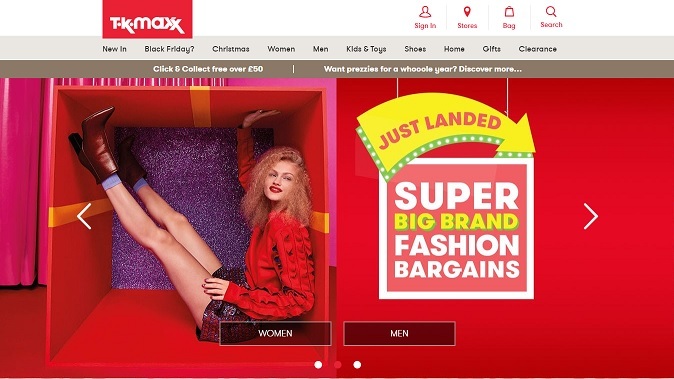 Anyone shopping TK Maxx last Christmas could have picked from a range of clothing, toys and gifts, all with up to 60% off the recommended retail price, and free delivery when you spent £75 or more. December was also host to some flash sale events featuring savings on luxury designer labels and offered exclusively to those who were already registered online with TK Maxx. If you wanted to take delivery of gifts before Christmas, then it was crucial to place orders before the 19th of December for standard postage, or by the 21st when using next day delivery. Those seeking a boxing day sale would have unfortunately been unable to find one; however, you would have found that TK Maxx topped up their clearance section with new lines with up to 80% off. You’ll find one of the best ways to shop the freshly added clearance bargains is to get email alerts by signing up to TK Maxx’s update newsletter. Step out in style whatever the season thanks to TK Maxx's menswear range. You can wrap up in jackets, hoodies and knitwear for the winter, while if you are shopping for the summer, you can bag yourself some new T-shirts, shorts or chinos. Smarten yourself up with blazers, waistcoats, shirts and trousers ideal for the office of going out, while you can also stock up on wardrobe staples such as polo shirts, socks and underwear. Search edits such as Big & Tall, Smart Casual and Formal Wear, while you will also find sportswear from leading brands like Nike, outdoorwear and fantastic deals in their men's clearance section. If you need some new shoes, they have something for every occasion, whether you want classic brogues or on-trend trainers, while their collection of accessories features everything from belts and sunglasses to ties and wallets. Your kids can look just as stylish as you -- for a fraction of the cost -- in fashionable and adorable boys' or girls' clothing from the hottest brands. However, as well as being able to dress your little one in designer jeans, dresses, coats, boots and tops, you can also replenish their stock of toys and books too. TK Maxx customers can view kids' clothing which is trending now or search by age -- from 1-2 years right up to 13+ years. Get your hands on key accessories like hats, gloves and backpacks, while if your child is in need of some new footwear, they offer shoes and boots in sizes from infant four to junior five. If you have just become a parent, you can stock up on baby clothes, while TK Maxx also sell changing, feeding and bathing essentials, plus pushchairs and nursery furniture. Every child loves their toys and when you shop online at TK Maxx, you can take your pick from actions toys, cars, puzzles, fancy dress, educational toys and arts & crafts, which are sure to keep them entertained. As well as being able to give your wardrobe an overhaul, you can give your home a new look by buying unique items for your living room, kitchen, bedroom, bathroom and more. Whether you are looking for home furnishings, bedding or cookware, they source homeware solutions from around the world. Discover seasonal items ranging from garden planters to Christmas trees and advent calendar options, while you can also shop by room if you need something for your dining room or child's bedroom. Find key accessories like lighting solutions, mirrors and home fragrance, while their collection of furnishings includes wallpaper, curtains, rugs and more. Whether you need home appliances, towels or a side table, TK Maxx can help make your house a home. Whatever you want to buy, don't forget to see if we have any TK Maxx discount code deals or take up our reward offers. If you are looking for the perfect gift for Christmas, a birthday or other special occasion, you will find some great ideas on the TK Maxx website. Search gifts for her, gifts for men, something the kids will love or the ideal present for the home. Whether you are buying for someone who loves travel, gadgets or beauty products, is Instagram obsessed or likes the finer things in life, there are plenty of options, including limited edition gifts. If you are buying for the woman in your life, choose from bath & body essentials, jewellery or handbags, while if you need something for the man in your life, you can make their day with men's grooming products, fragrances or stainless steel watches. If you have a child, they have toys and games for all ages, while you will also find audio & tech, food, pet and novelty gifts. Search by price if you want to stick to a budget, while they also sell gift cards (which can be used online or in a TK Maxx store) and wrap too. TK Maxx was first launched in the UK and Ireland in 1994, and is part of TJX Europe, which also comprises the HomeSense brand and is part of TJX Companies, Inc.
TK Maxx expanded in to Europe in 2007 by opening stores in Germany, while their online store was launched in the UK in 2009 -- the same year that stores were opened in Poland. This European expansion of TK Maxx continued in 2015 as stores were opened in both Austria and the Netherlands. They believe that value is a combination of price, quality, brand and fashion, and they buy from big names, designer labels, up-and-coming brands and those who are known for stylish fashion and one-off gems. They generally don't do TK Maxx sale events, promotions or gimmicks -- just great prices every single day by negotiating the lowest possible prices and passing savings on to customers. Their buyers choose many different colours, styles and fabrics to ensure there is always great choice, while some of what they sell is manufactured for them or designed by their own fashion and style experts. Get all the big labels at small prices at TK Maxx. Discover their range of men's and women's clothing, shoes and accessories, as well as children's clothes and homeware. The large majority of products they sell is brand name merchandise sold at up to 60% less than RRP. As well as selling big names and designer labels, they also have top high street brands, up and coming labels, stylish fashion and one-off gems. Shop for dresses, shirts, tops and bags, while you can browse homeware for the living room, kitchen, bedroom, bathroom or garden.